Hurricane Blower works fantastically well for removing dust specks off lenses, sensors and SLR mirrors without touching/damaging the surfaces. When the cleaning cycle is completed, the strongly constructed rubber bulb refills very quickly and is ready for another blast of air. 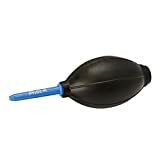 The Phot-R Hurricane Blower is a brilliant cleaning accessory to have in your camera bag. It works fantastically well for removing dust specks off lenses, sensors and SLR mirrors without touching/damaging the surfaces. It fits comfortably in your hand and delivers a strong blast of air as it cleans. When the cleaning cycle is completed, the strongly constructed rubber bulb refills very quickly and is ready for another blast of air. The unit is resistant to temperature swings making it a viable tool in all kinds of climates. This entry was posted in Discount Photography and tagged Blower, Camera, Cleaner, Cleaning, Dust, Hurricane, lens, PhotR, Professional, Sensor, Video by Ball Photo. Bookmark the permalink.